BROOKLYN, N.Y. — Millions of people lined the streets here on Labor Day for the annual West Indian American Day Parade, billed as the largest parade in the United States. And, of course, the People’s Weekly World was there. For most of the day, Brooklyn’s Eastern Parkway and all of the side streets branching off of it were a rainbow of color. 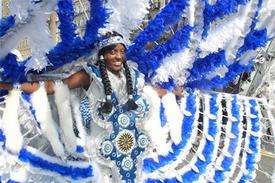 The traditional costumes of the Caribbean nations were there, as well as thousands upon thousands of flags: those of Jamaica, Trinidad and Tobago, the Virgin Islands, Barbados, Antigua and a host of other nations. This year, the parade’s 40th, saw the first-ever delegation representing Guadalupe. A large part of any culture is its food, and there was plenty of food on display and for sale. Dozens of vendors sold everything from oxtail to roasted corn-on-the-cob to jerk chicken. The People’s Weekly World was distributed and received well. A small group of distributors worked through the crowd, giving out hundreds of papers to parade-goers. People expressed appreciation for the New York stories in that issue, which included an article on preparations by city taxi drivers to strike and the fight by the Transport Workers Union for better safety on the track. Particularly well received was a story about the police beating of a civil rights lawyer — and the community fightback — that occurred in Crown Heights, the heavily Afro-Caribbean neighborhood where the parade took place. Readers can give to the 2007 fund drive via credit card, check or money order: PWW, 235 W. 23rd St., New York, NY 10011, (646) 437-5363, or on our website homepage .